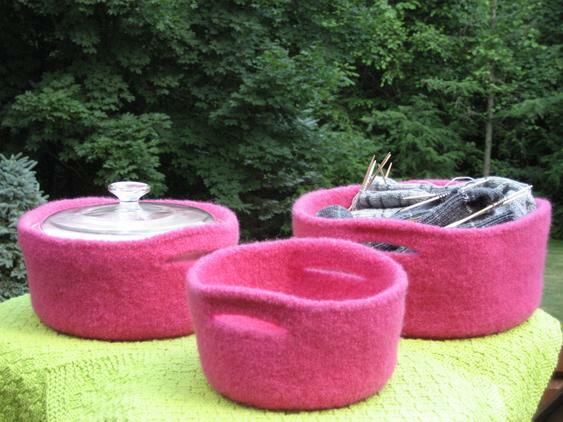 The Felted Bowls are a quick to knit project. Each bowl has a little handle knit right into the bowl on each side. Make them for seasonal displays, for the holidays, or for gifts. The large bowl is the perfect size to hold yarn or your next knitting project. A Corning Ware French White casserole bowl fit perfectly in the medium size. The small bowl is approximately 7 1/2 inches in diameter by 3 3/4 inches high, the medium bowl is approximately 9 1/2 inches in diameter by 4 inches high, and the large bowl is approximately 11 1/2 inches in diameter by 4 1/2 inches high. 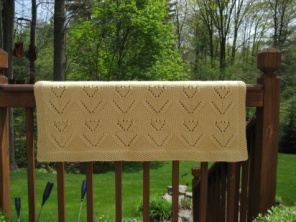 The Saratoga Blend is a pattern with two different size towels, a place mat, a washcloth, and a hot pad or dishcloth. 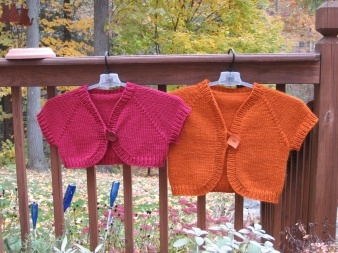 The pattern includes four easy stitch patterns that can be used to make any of the items. Click on the picture to the left to see the different stitch patterns. The items are all made in 100% worsted weight cotton. Instead of using paper towels, make your own towels. Your whole home will be “green” and you will be saving money and the planet. The larger towel can be used in the kitchen or bath and would also make an excellent towel for a baby or small children. 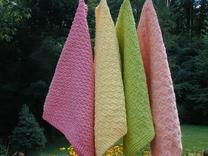 The smaller towel can be used in the bathroom or in the kitchen and could also be used as a sturdy napkin. The place mat is a generous size and can be easily washed, dried and back on the table. The hot pad can be used as a dish cloth or as a washcloth for a baby. These items make excellent gifts and will add luxury and style to any kitchen or bath. 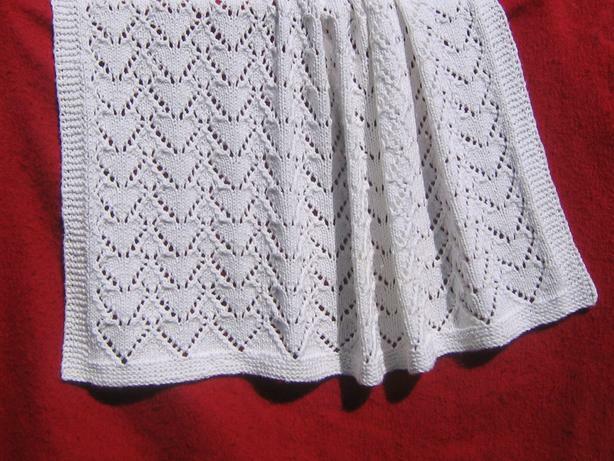 The Lacy Hearts Throw is made up of many lacy hearts. It is a lovely gift for a newborn, a newlywed, or for your sweetheart. It would also make a perfect decorative throw to drape on a chair or bed to chase a chill on a cold evening. And of course, it would make a perfect Valentine’s Day gift. Make it in worsted weight 100% cotton or 100% wool. It is a challenging project, but the result is worth the effort. The Saratoga Bag is felted and shaped like a Bermuda bag. 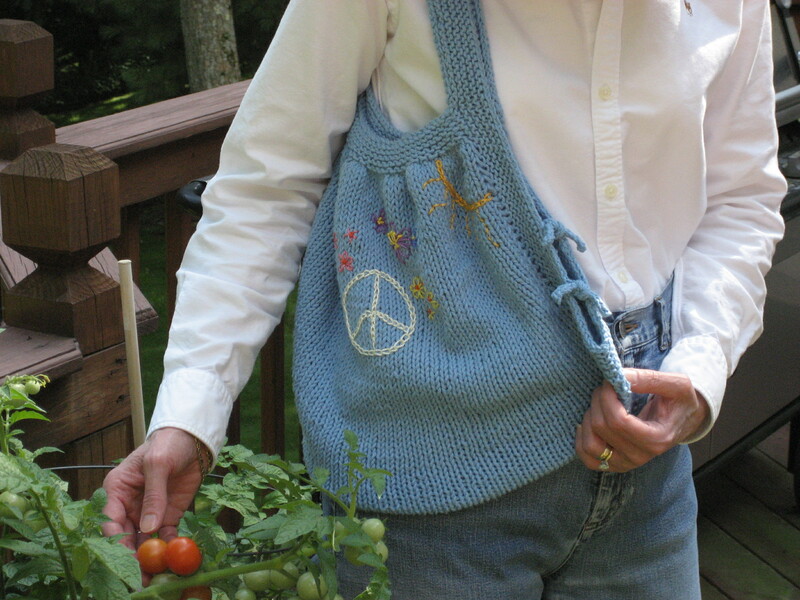 It has a little handle knitted right into the bag and comes in three sizes. The pattern includes directions for a knitted flower embellishment. Bulky weight 100% wool yarn is used. The Holiday Mitten is a large felted mitten that can be used as a holiday decoration on a door or door handle to hold cards or greenery. It can also be hung on the mantle like a stocking. Use it as a hostess gift or as a festive purse during the holiday season. Worsted weight 100% wool yarn is used. 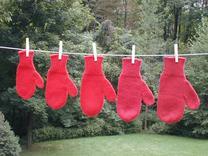 The Saratoga Mittens will keep your whole family warm during the winter. The mittens feature a rounded hand and thumb. They are sized for a child’s medium and large, and for an adult small, medium, and large. They are made in worsted weight wool.